The Baku-Tbilisi-Kars (BTK) railway will serve to increase the transit potential of the countries of the region. 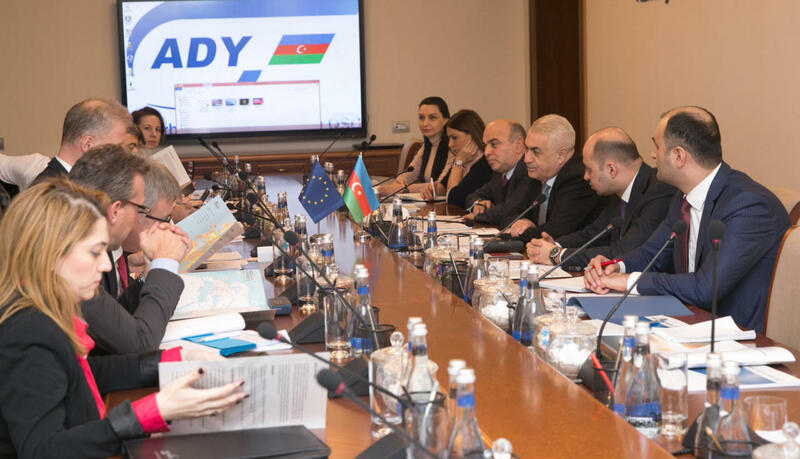 The statement came from Javid Gurbanov, Chairman of “Azerbaijan Railways” CJSC during his meeting with the delegation led by Director General for Mobility and Transport of the European Commission, Henrik Hololei. Gurbanov informed the guests in detail about the transport and logistics potential of Azerbaijan, as well as works on the implementation of international and regional projects. He told about the Trans-Caspian International Transport Route (TITR), the transport corridors “North-South”, “South-West” and, in particular, about the Baku-Tbilisi-Kars railway, which was commissioned in October last year. Interest in the project was particularly expressed by the Central Asian countries, including Turkmenistan, Kazakhstan, Afghanistan, as well as Pakistan, China and India. Through this railroad running through Azerbaijan, Georgia and Turkey, and further through the railway tunnel under the Bosphorus (with the subsequent combination of Trans-European and Trans-Asian rail networks), cargo and passengers are able to move smoothly from Asia to Europe and vice versa. This, in turn, will serve to increase the transit potential of the countries of the region. 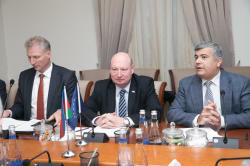 In turn, Henrik Hololei highly appreciated the strengthening of the transport and logistics potential of Azerbaijan, and the work done by the Azerbaijani side in launching the BTK railway and establishing other international transport corridors. The sides also discussed the expansion of bilateral cooperation. The International North–South Transport Corridor is a 7,200-km-long multi-mode network of ship, rail, and roadroute for moving freight between India, Russia, Iran, Europe and Central Asia. The corridor is planned to transport 6 million tons of cargo per year at the initial stage and more than 10 million tons of cargo in the future. 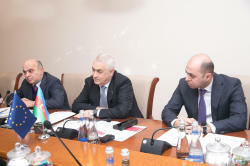 The agreement on creation of the Trans-Caspian International Transport Route (TITR) was signed in April 2016 in Baku by the railway authorities of Azerbaijan, Georgia and Kazakhstan. About 300,000-400,000 containers are expected to be transported via the Trans-Caspian international transport route by 2020. Growing interest in the transport infrastructures passing through Azerbaijan's territory is expected to make the country a major transport hub in the region. The BTK railway is constructed on the basis of the Azerbaijan-Georgia-Turkey intergovernmental agreement. The main purpose of the project is to improve economic relations between the three countries and gain foreign direct investment by connecting Europe and Asia. In February 2017 the EU and Azerbaijan launched negotiations on a new strategic agreement that will replace the old one. 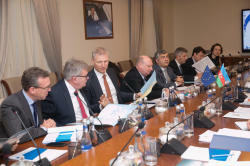 The EU is Azerbaijan's first trading partner representing 51 percent of Azerbaijan's total trade. The EU’s exports to Azerbaijan consist primarily of machinery and transport equipment whereas EU imports from Azerbaijan cover mainly oil and gas (98 percent of total imports).